a refurbished Amfleet coach car. 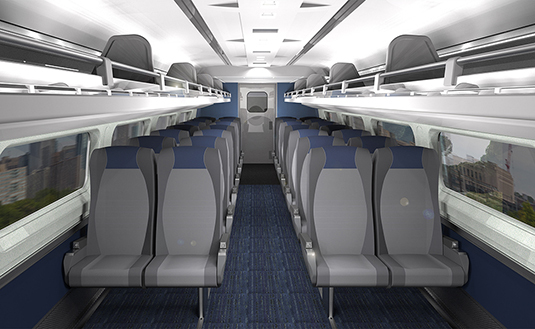 Amtrak recently announced that it is investing in an extensive overhaul of the interiors of the famed Amfleet I cars. 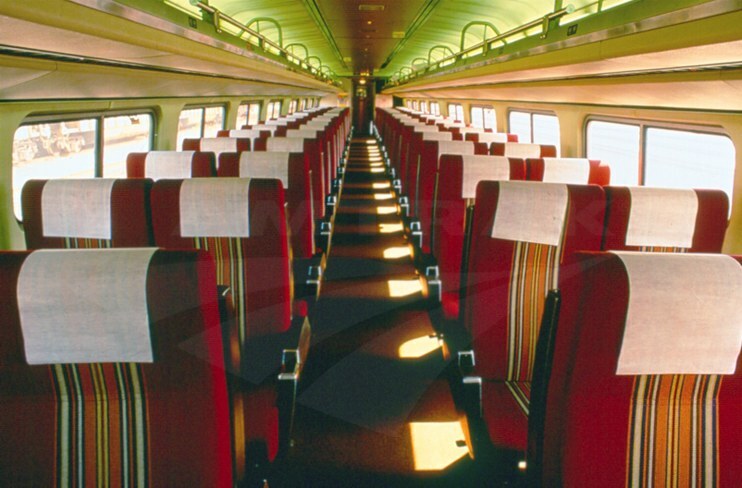 First introduced in 1975, the more than 450 Amfleet coach and cafe cars – recognized by their rounded, tubular stainless steel bodies and aerodynamic fluting – are used primarily on routes east of the Mississippi River such as the Northeast Regional, Carolinian and Illinois Service trains. 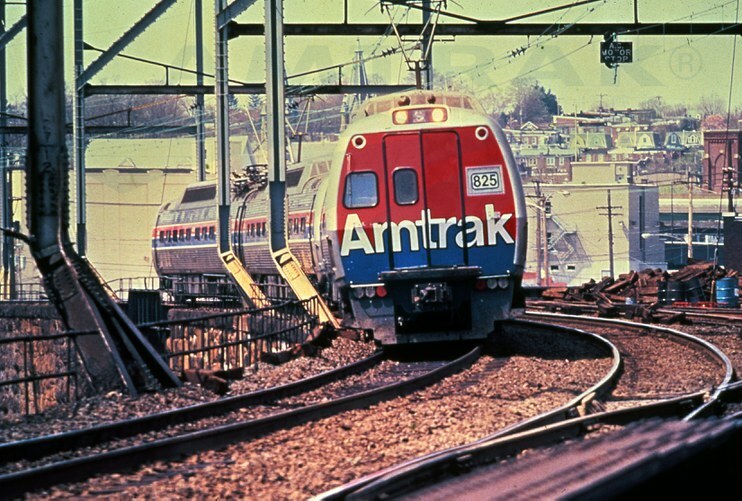 The Amfleet, along with the bi-level Superliner equipment generally found out west, form the backbone of the Amtrak car fleet. Just as many of us periodically update our own living spaces, the overhaul program is meant to create a more comfortable customer experience. Through a close study of customer feedback, the Amtrak design team zeroed in on a crisp, modern look and cleaner restrooms. The process of updating all cars should take about nine months and represents a nearly $17 million investment. By employing a strategic, phased approach, Amtrak will ensure uninterrupted train service for customers. Just as the Amfleet cars were proudly built by the Budd Company at its Red Lion plant in northeast Philadelphia, all of the interior components for the refresh program are being manufactured in America. Amtrak is also identifying sustainable ways to reduce waste and reuse and recycle as many of the retired materials as possible. In anticipation of the refreshed Amfleet cars hitting the rails, below we take a quick look at their construction and past decorative schemes. 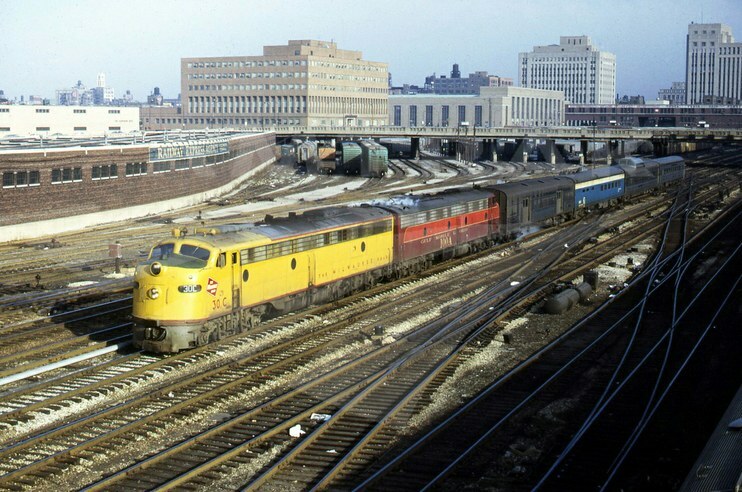 In connection with the start of Amtrak service in May 1971, the company handpicked approximately 1,200 cars from a total pool of 3,000 held by the two dozen predecessor railroads that had handed over their passenger service obligations to Amtrak. Many of these inherited cars wore various paint schemes, which is why these early years are sometimes referred to as Amtrak's "Rainbow Era." 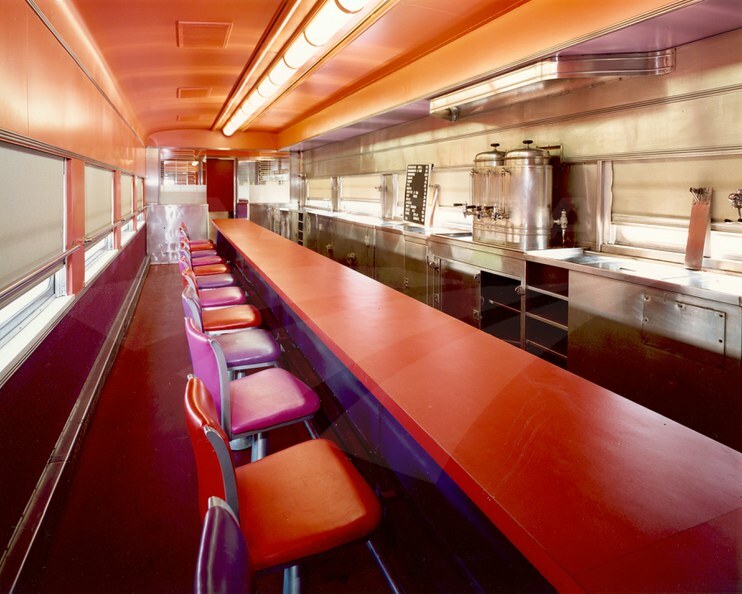 A lot of effort was put into modernizing the cars, including the installation of vibrant decorative schemes as seen in this refurbished lunch counter-diner/dorm car. At the same time, the company also began planning for the purchase of brand new stainless-steel single-level and bi-level cars. The new single-level cars, later known as Amfleet, were based on the design of the Metroliner cars shown above. 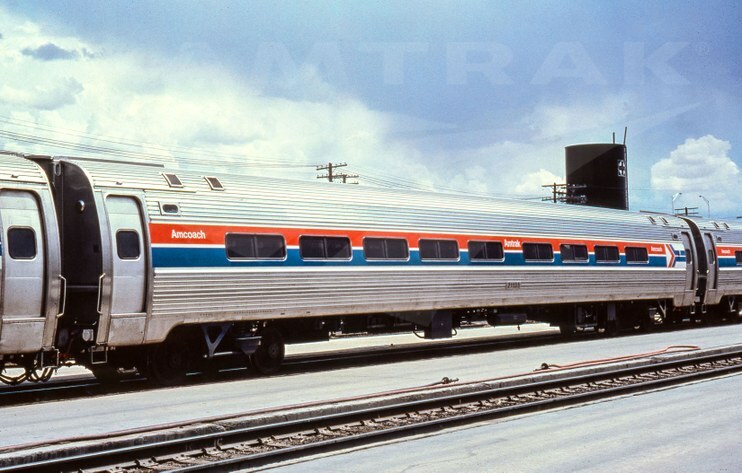 The Metroliners were used as a prototype due to their popularity among travelers on the high-speed Metroliner service between Washington, D.C., and New York City. 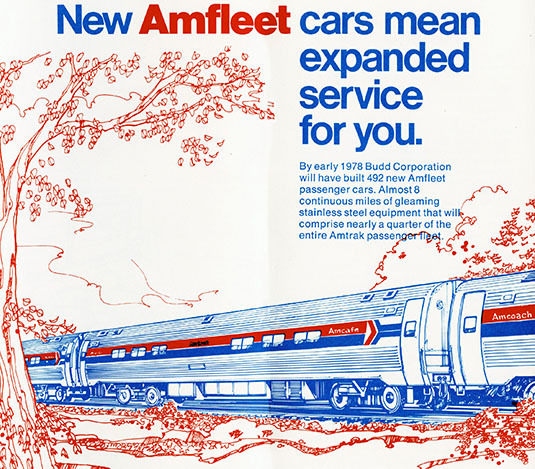 By December 1975, the Budd Company produced a finished Amfleet car every working day. The Amfleet featured five car configurations, two of which were coaches: an 84-seat version for use on short-distance corridor services and a 60-seat version used on long-distance routes. Above is a view into an Amclub, which had two-by-two coach seating on one end, a standard food service unit in the center and two-by-one club car seating on the other end. The club car section, also known as Amclub, was staffed by an attendant who provided at-seat food and beverage service. 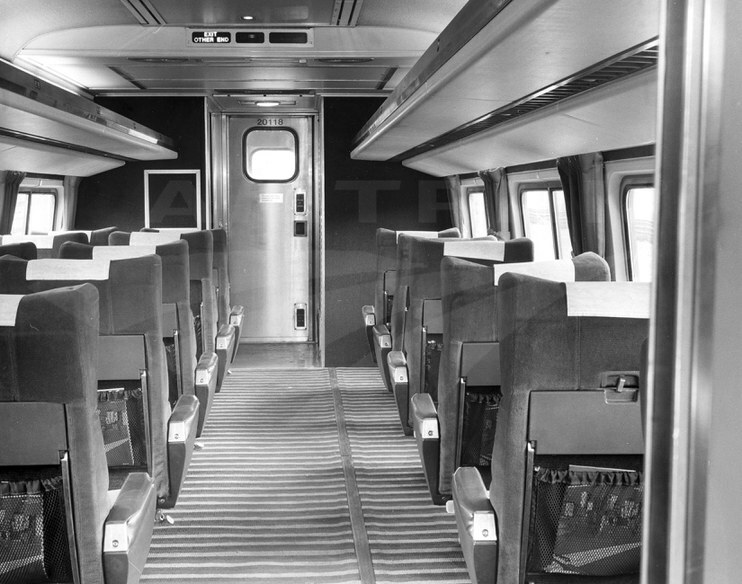 The other food service cars had coach seating at one end and either tables (Amdinette) or additional coach seating (Amcafe) at the other end. 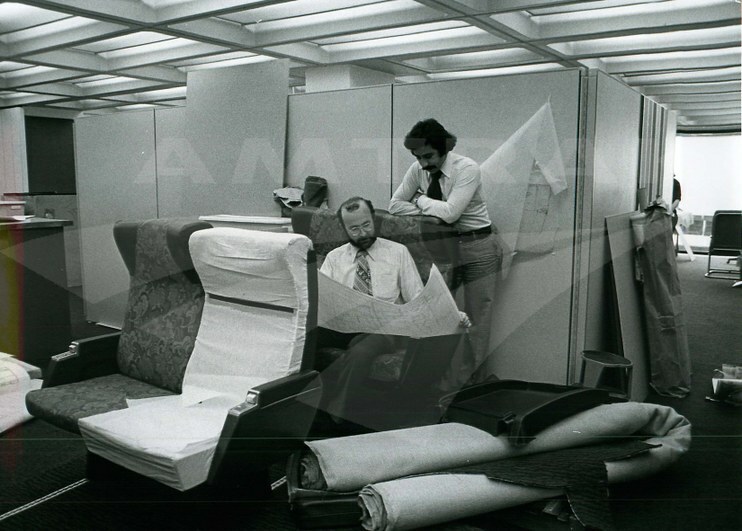 Here Amtrak Designer Ralph Dolinger (left) consults with Assistant Engineer Arjang Roshan on seating. The textile pattern on the seat appears quite similar to what was ultimately chosen for the new Amfleet cars. 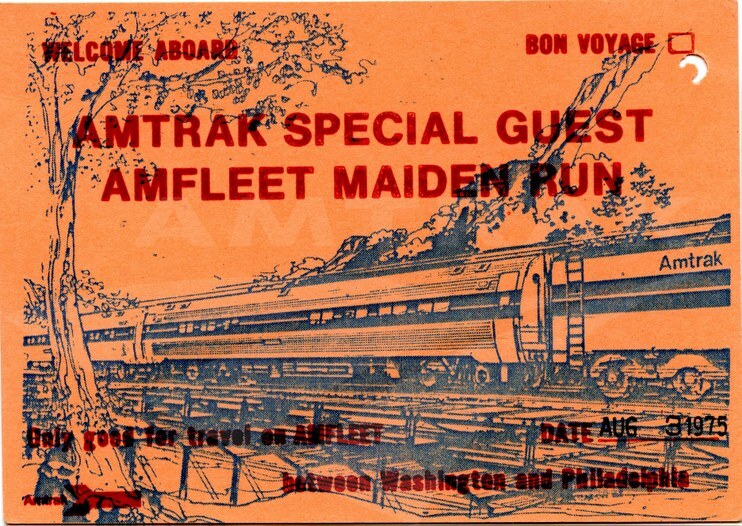 The first of the new single-level Amfleet cars went into revenue service on August 7, 1975, on the Statesman (Washington-Boston). 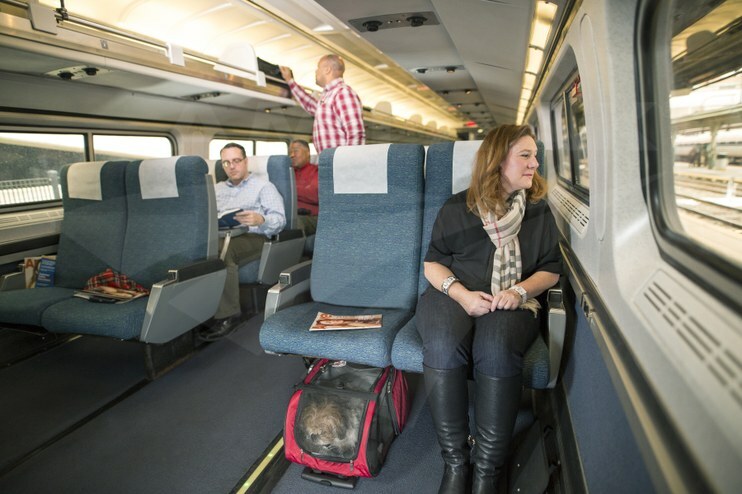 Four days earlier, Amtrak invited employees and their families on a test run between Washington and Philadelphia to gauge reactions to the car interiors and the ride quality. This ticket not only guaranteed a spot on the train, but could also be kept as a memento of this special trip. 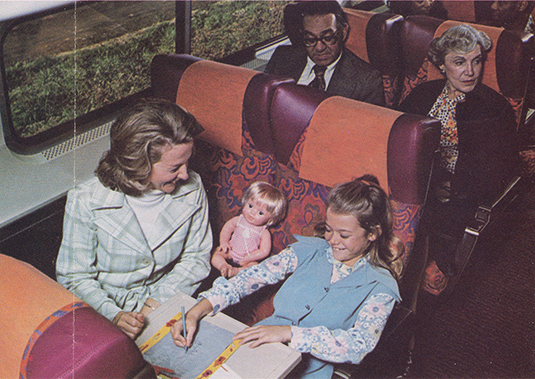 Early advertisements touted the cars’ “dual temperature control system…plush carpeting…and wider, more comfortable reclining seats to relax in.” Drop-down tray tables allowed passengers to “…eat, drink or even get some work done, right at your seat.” Seats were covered in a multi-hued, floral-inspired pattern incorporating pink, red and purple. Amclub seats featured a more subdued red pattern. Here the club car attendant serves customers at their seats. In the late 1990s and early 2000s, as part of the Capstone Program to support the launch of Acela Regional service (later rebranded Northeast Regional), many of the Amfleet cars were refurbished at Amtrak’s Bear Shops in Delaware. Electrical and mechanical systems were overhauled; wheels and running gear renewed; and luggage areas, flooring, walls, lighting and seats upgraded. Important changes were made to the restrooms to ensure accessibility. The current blue color scheme dates from this period; the seat upholstery incorporates touches of yellow and green that catch the eye. 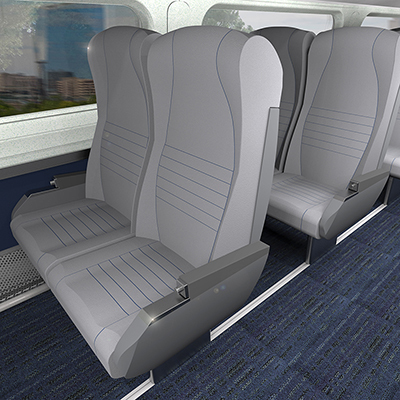 In Amfleet Business class cars, which offer customers more legroom, many seats are upholstered in a rich blue fabric with a subtle triangle motif for visual interest. 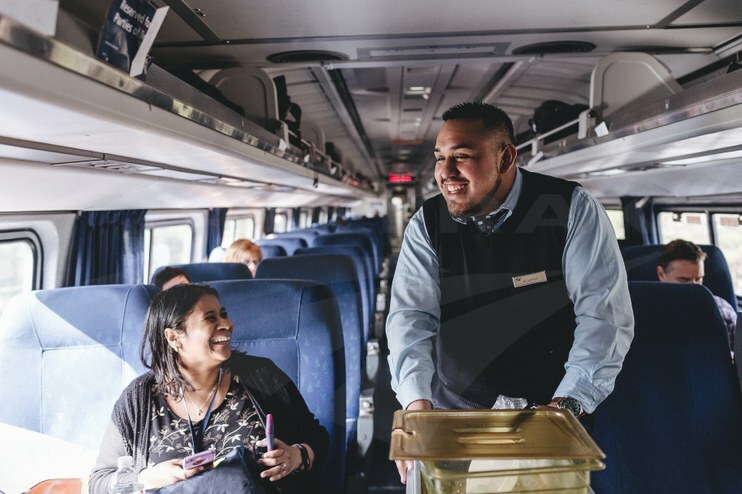 On the Carolinian (Charlotte-Raleigh-New York) shown in this image, Train Attendant Heber Lopez offers a complimentary non-alcoholic beverage to a customer. 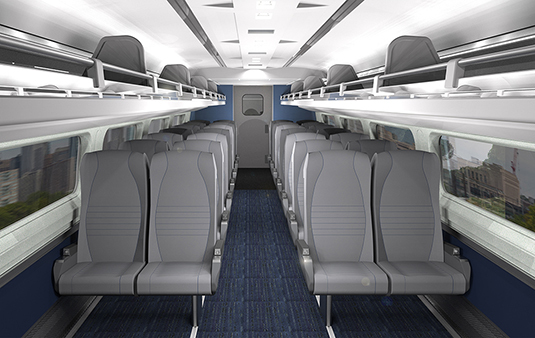 Under the latest Amfleet refresh, the interior color palette will incorporate neutral grey tones, which are already used on the premium Acela Express (Washington-Boston) service. The use of blue accents in the headrest will visually distinguish Business class seating (above) from coach seating (below). With more than four decades of service to America’s Railroad® and its customers, the well-built, gleaming Amfleet has itself become a symbol of Amtrak recognized by travelers across the country. Do you have any favorite memories of traveling by Amfleet? Share them with us in the comments section below. 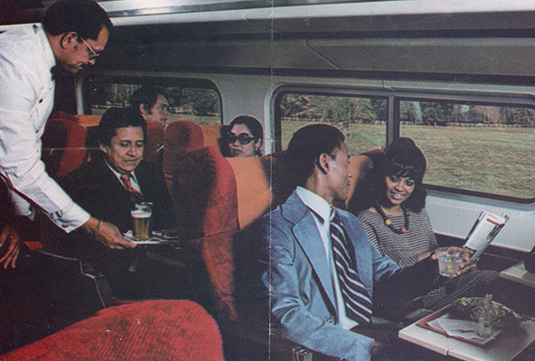 1 According to an image found in the March 1979 issue of Amtrak NEWS.